Paasche TS-SET Talon Double Action Siphon Feed Airbrush Set TS. Brand New in Factory Packaging. In Stock Ships Within 24hrs. Paasche TS-SET Talon Double Action Siphon Feed Airbrush Set. This is the Paasche Double Action Internal Mix TS-Set Talon Siphon Feed Airbrush System. Ideal for crafts, illustrations, model cars, stenciling and touch-ups. Internal mix mixes air and paint inside airbrush producing a fine spray. TS#2 Double-Action Siphon Airbrush w/. A-1/8-6 Air Hose with Couplings (PASR3025). 1oz (29cc) VL-1-OZ Color Bottle Assembly (PASR0012). 1/4oz (7cc) VL-1/4-OZ Metal Color Cup (PASR0014). 1oz (29cc) H-194 Plain Jar, Cover & Gasket (PASR3194). TTALB "22 Airbrush Lessons" Booklet. Please note: I will not put less amount on custom papers, so please don't ask. You can return any item in Brand New/unopened condition (within 14 days). Please request for an invoice. 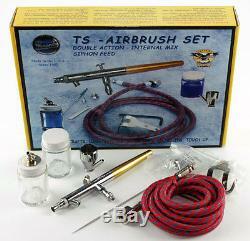 The item "Paasche TS-SET Talon Double Action Siphon Feed Airbrush Set TS" is in sale since Tuesday, March 04, 2014. This item is in the category "Crafts\Art Supplies\Airbrushing". The seller is "power_hobby" and is located in Mahwah, New Jersey. This item can be shipped to United States, to all countries in Europe, to Canada, to Japan, to Australia.